The first leg of the Federation Cup Semi-finals match will be played in Kolkata between Mohun Bagan AC and Shillong Lajong FC at the Barasat Stadium on Sunday at 7pm. The match will telecast live on Ten 2 at 7pm. (As per the information given by the AIFF Media). Mohun Bagan, advanced to the semi-finals after beating Goan club Salgaocar FC with an aggregate of 7:2. Mohun Bagan won the first leg 3-2 in Goa and registered another sensational victory against the Goans with a scoreline of 4-0 on Thursday. Yusa Katsumi and Jeje scored a piece while Sony Norde netted a brace for their team and comfortably sailed through to the final four of the Federation Cup 2016. Meanwhile, Shillong Lajong FC booked a semi-final berth winning against East Bengal in a dramatic fashion with an aggregate scoreline of 4:3. The first leg between the two sides was played in Shillong and the home team registered a 2-1 win with goals from Chinglensana Singh and Fabio Penna Henriue while Do Dong Hyun managed one for East Bengal. The second leg was extended to extra time as both teams were locked at 2:2 on aggregate in normal time. It was Uilliams Souza who sealed the deal for Lajong, as he netted a Penn Orji cross in the 114th minute of the game taking the final score line to 2-2 and winning 4:3 on aggregate. Thangboi Singto’s men were ecstatic as they braved against all odds to overcome the mighty East Bengal denying their recently appointed coach Trevor Morga another win against the boys from the hills. The last time Lajong and Mohun Bagan met was in the I-League. The two teams drew twice against each other in the recently concluded I-League season. First round was played in Kolkata which saw Lajong playing a good game of football holding to the-then defending champions to a 1-1 draw. 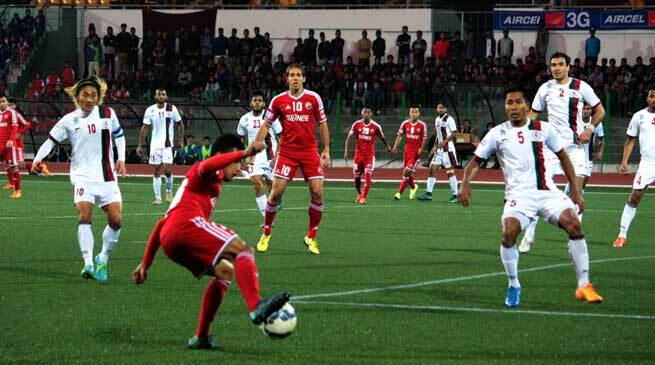 Then the two teams met again in Lajong’s home fortress and the match ended in a 2-2 draw. That was the I-League! While Mohun Bagan coach Sanjoy Sen said, “Shillong Lajong are a very good side. They got past East Bengal twice and that it itself is a great achievement. We have to be careful since they possess the necessary Players to hurt our chances”. Both teams will look to make the most from the first leg encounter and add the extra advantage to their side before they move to Shillong for the second leg of the semi-finals. As Mohun Bagan were unable to retain the I-League title, they will be very eager to clinch the Federation Cup title so that they can still compete in the AFC Cup next season. Shillong Lajong FC stands in their way, who themselves are hoping to perform better in the Cup Competition after being placed 6th in the concluded I-League. The match promises to be an exciting one as both teams will fight hard to advance to the Final of the Federation Cup 2016.